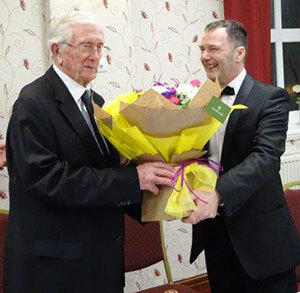 Brethren of Anchorsholme Lodge No 5854 were pleased to host one of the most special occasions in any Freemason’s career, Norman Gregson a long-standing member of the lodge celebrating 50 years in Masonry. On this special day, Assistant Provincial Grand Master David Randerson was the principal guest who led the celebrations on this golden day. David Randerson (left) and Norman Gregson. The lodge was promptly opened by the WM Jamie Blundell whose adept handling of the administrative business of the lodge set the stage for Norman’s ‘this is your Masonic life’ starting with Deputy Provincial Director of Ceremonies entering to announce David Randerson was without and demanded admission. David entered with a glittering entourage comprising of fellow grand officers, North Fylde Group Chairman Peter Greathead, Harry Cox, Tony Hough, Duncan Smith and Keith Jackson who were joined by newly appointed acting Provincial grand officers, David Edwards, Jim Gregson, Terry Murtagh, Ian Halsall and Barry Fitzgerald. Jamie welcomed David on behalf of the lodge and, as is protocol, he offered David the gavel of the lodge. David said: “It is always an honour to receive the gavel of any lodge and on this occasion, I will retain it for a short period.” David then asked Barry Fitzgerald to place the celebrant in a comfortable chair before him. David started the presentation by setting the scene for the year Norman was born, 1931 when George V was on the throne and Ramsay MacDonald was Prime Minister. Al Capone was convicted of tax fraud, Abbey Road Studios were opened by Sir Edward Elgar, Lancashire regained the County Cricket Championship, John Le Carre and Les Dawson were born and in Radcliffe, near Manchester, so was a certain Norman Gregson. Norman Gregson (left) takes wine with Jamie Blundell. Norman was born in Radcliffe to Alice and Norman Gregson. His father had been in the RAF during the war and Norman had twin brothers Geoff and Gordon. David said that the early years were tough for Norman during the Second World War. Manchester was heavily bombed but fortunately, apart from one stray bomb, missed Radcliffe. Norman attended junior school where he was able to pass a scholarship to a local technical college. He also enjoyed playing football for the local Sunday School and attended Bible classes. David moved on to Norman’s work life where his first job was at Lancashire Electricity Power Company where he started as an Articled Electrical Apprentice and continued his technical training on day release. Norman was called to National Service in the RAF, David noted that all three brothers were to serve in the RAF together as they were called up at 18. Geoff went to Tripoli but for the last few months of Norman’s time, he served with his brother Gordon at Mamby in Lincolnshire. This was an old American airbase with a long runway and it was needed by the new English Electric Lightning aircraft. Norman’s job was to make sure any electrical work was up to speed to accommodate the plane. David continued saying that after National Service Norman returned to Lancashire Electric, which became Central Electricity Generating Board. Norman steadily progressed to achieve Chartered Engineer status and Membership of the Institution of Engineering and Technology and the Institution of Mechanical Engineers and was involved in running and building power stations. Moving to Norman’s personal life David started by saying that he met his wife to be Margaret at a dance at the local Palais de Dance and they were to marry in 1953 in a church in Radcliffe while he was in National Service. Norman and his wife have been blessed with a son and two grandchildren. Norman and Margaret moved to the Fylde Coast in 1984. Harry Cox proposing the toast to Norman Gregson. Norman and Margaret enjoy many hobbies and interests including a passion for golf. Joining North Shore Golf Club, Margaret is actively involved with the ladies committee and she has received a 25-year certificate for her work at the hospice and been a great supporter of the Blackpool Sick Poor. This is the oldest charity in Blackpool, established over 100 years ago, before the NHS came into existence and is still going strong today. At this point David moved on to Norman’s Masonic life saying that his interest in the Craft was stimulated by his friendship with a headmaster at his old primary school who was a member of Moon Lodge in Accrington and in 1969 Norman’s proposer into Radcliffe Lodge No 2701 was Bert Sutcliffe and his seconder was the lodge secretary. Radcliffe Lodge met at the Boars Head Hotel which had a special lodge room where several other lodges also met. As the pubs changed though they were looking to move Masonry out, something we are familiar with here on the Fylde. The lodges decided to look for an alternative Masonic home and they all got together in 1977 and bought an old local school, St Oswells Bishop, on the road from Bury to Bolton which proved ideal and where lodges still meet today. After Norman’s initiation, passing and raising he progressed through all the offices finally attaining the chair of King Solomon in 1980. Norman’s year as WM was very enjoyable one with many social events at which his wife supported him. After a year as IPM Norman became chaplain, an office he held for many years and he was rewarded with appointment to his first Provincial office in East Lancashire with an acting rank of PrAGSwdB in 1988. Further honours followed when he was promoted to PPrJGD. Norman joined Radcliffe Chapter No 2701 in 1976 until 1990 but didn’t progress through the chair and unfortunately Radcliffe Lodge and chapter have closed. Norman Gregson (left) receives flowers for Margaret from Jamie Blundell. After Norman and Margaret moved to the Fylde Coast, he met and became good friends with Bill Wright, a renowned former squadron leader and member of Anchorsholme Lodge. He invited Norman as a regular guest visiting for quite a number of years before joining in 1990. At this point David Randerson called on the assistant secretary to read a short précis of that meeting. 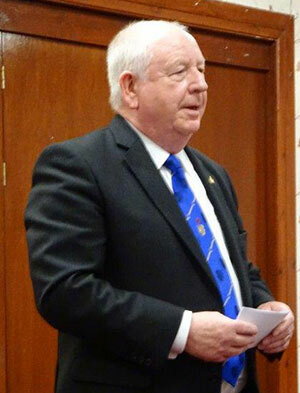 David summed up by saying that Norman, for the past 35 years has been a regular figure there at Anchorsholme Lodge, 29 as a member and in his mother lodge for 50 years. David added that Tony Harrison was very much aware of his 50th and he had received a phone call from him that morning. 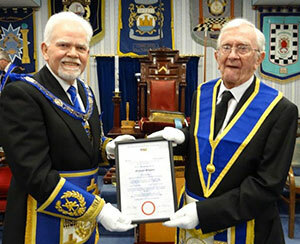 David then called on Tony Hough the North Fylde Deputy Group Chairman and fellow member of Anchorsholme Lodge to read out the certificate signed by Tony Harrison. In addition, Tony Hough presented him with a 50th year Masonic badge. 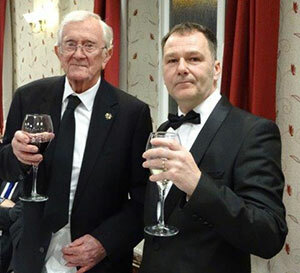 At the festive board Harry Cox had the pleasure of proposing the toast to Norman in which he reminisced on many happy times in the lodge and Norman’s hard work and commitment to not only Anchorsholme Lodge but to Masonry. Norman was presented with a gift for himself and a bunch of flowers for his wife Margaret for all her support to him and the lodge. A raffle held during the evening raised a magnificent £215 to Masonic charities. Pictured from left to right, are: Terry Murtagh, Ian Halsall, Jim Gregson, Duncan Smith, Tony Hough, Keith Jackson, David Randerson, Norman Gregson, Jamie Blundell, Harry Cox, Peter Greathead, David Edwards and Barry Fitzgerald.